So I have about an 7-8 minute walk from where I park to my building at work. The last couple mornings and this afternoon I used the "Outdoor Walk" workout to track that activity but when it's all said and done, I end up with 0 distance, this 0 pace etc. the only thing I get is my heart rate. I'm thinking what's happening is that it might currently be taking those walks as pieces of me calibrating my watch. Any thoughts? You know ... I have only ever done one outdoor walk since I got my AW (the rest have been runs and then I started using the third party run apps) and I just went to look for that walk and it doesn't even exist! Really weird. I haven't had issues with the Outdoor Run option, though. Hmmmm... That's interesting. I've tried to just use "Other" but I've read that it assumes at minimum a brisk walk and basically gives you credit for every minute that it's running. I don't want that. Yea. I only use that when I'm lifting weights .... Which AW definitely doesn't have an option for. I'll have to go try the Outdoor Walk one again and report back. Really weird. I plan to run tomorrow morning. Maybe I'll end my run a few minutes earlier and use the OW one when I cool down. I'll try it again in the AM and see if my suspicions about it calibrating are correct. Do you swing ur arms while u walk? I don't swing my arms enough so that the accelerometer doesn't register movement. Also if my hands r full it doesn't work either. So now if I'm on the treadmill I'll just go in "other" mode and more or less give up on recording the outside walk unless I remember to swing my arms. It's kind of hard to do when I'm walking my dogs. I do swing my arms but maybe I'm not swinging my watch arm enough. It's a tough thing because I want to credit on my green ring but I don't want to over emphasize the arm swinging and get false readings. I've been wondering the same thing. Is it possible the phone is reading one thing and the watch is reading something else and the two are not syncing/communicating/playing nice together? That could be the case. This morning I also had a thought that maybe it's reading no distance is because our entire site could potentially share one GPS location (crazy because the site is HUGE) and this walking onsite yields 0 distance because you haven't changed your location. When I click on Outdoor Walk on my Apple Watch, it says you have to accumulate 20 minutes of walking for the activity. You mean for the distance walked, you have to walk at least 20 minutes? Yeah I'd read that but it also states that you don't have to get the 20 minutes all at one time. I know full well I've accumulated 20 minutes now and after work today my walk to the truck still yielded 0 distance and 0 calorie burn. That's really weird. Strava flaked out on me at the beginning of my run this morning so I ended up using my workout app and started it about 90 seconds after I started my run. It seemed to work fine. I didn't have time to do a short walk after my run. I'll try to do that tomorrow. Unless something new has recently changed in watchOS 2.x, as far as I know the Apple Watch only allows one workout app at a time to have an active workout session. If another app starts a workout on the Watch the previous app's workout will immediately end. 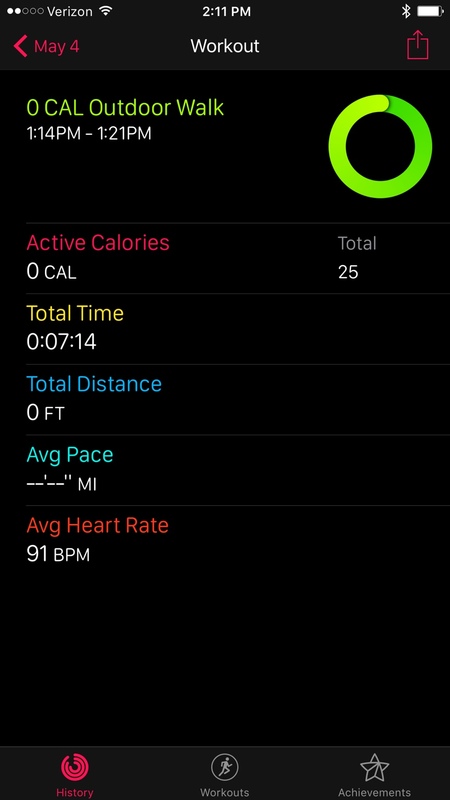 Is it possible you have another 3rd party fitness tracking app that's automatically starting another workout session and thus ending the session you had just previously started on the Watch's native Workout app? Are you certain no other fitness apps have open activity sessions? Also, are any traces of your finished activites showing up elsewhere e.g. in aggregate on the iPhone's native Health (Kit) app? Could there be a Health Kit global permissions setting that's perhaps been inadvertanly turned off? The Apple Watch only allows one workout app at a time to have an active workout session. If another app starts a workout on the Watch the previous app's workout will immediately end. Is it possible you have another 3rd party fitness tracking app that's automatically starting another workout session and thus ending the session you had just previously started on the Watch's native Workout app? Is your activity showing up elsewhere e.g. in the iPhone Health (Kit) app? I don't have any 3rd paper apps on my watch. I turned off activity yesterday and will use my watch as a smart watch only. Picked up a Fitbit Charge HR on Craigslist to be activity tracker. As a developer (cheering on the Watch in the fitness category) I'm sorry to read that ☹️. Admittedly the Watch is difficult to program, and Health Kit and Workouts even more difficult to get just right. I remain convinced Apple is totally on to something cool, and I'm not giving up on Watch app development but the current version (hardware and especially OS) still has a long way to go. Hoping that this first generation of not so great 3rd party apps doesn't spoil the Watch's future-- there's so much great 3rd party watchOS dev potential, just as there was (and still is) with iOS. You do stop and save the walk, right? Where do you keep your phone? Both should track steps and the app figures it out. Maybe that's just the first time you use the walk function. It's certainly not true after that. On occasion I lack 60-80 calories meeting my daily move goal and will walk a brisk mile (say 14 minutes). The watch records it perfectly.